The John Chappell Natural Philosophy Society (CNPS) is a world-wide think-tank of critical thinkers made up of professors, PHDs, scientists, engineers, and layman who openly criticize mainstream physics and cosmology and who propose alternative theory, philosophy, and models. Members have been together for over two decades using critical thinking to find flaws and failures in mainstream science and propose new directions in natural philosophy. The group holds annual conferences, weekly Saturday morning video chats, and publishes an annual proceedings. During their annual conference, they award lifetime scientific awards to prominent members. 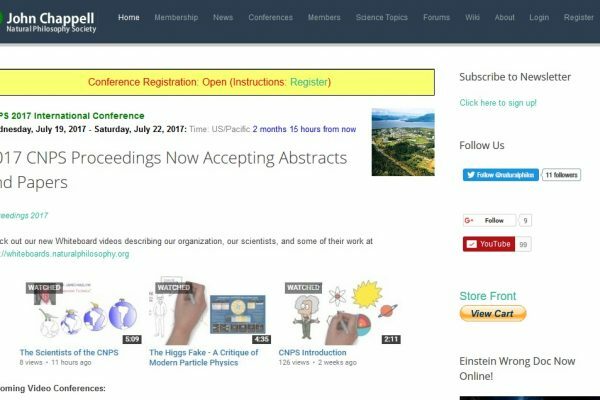 They are also sponsor of the http://wiki.naturalphilosophy.org.